Abstract: Of the definitions listed in the International Statistical Classification of Diseases and Related Health Problems, tenth revision (ICD-10), two disease descriptions can be found together: "idiopathic aseptic bone necrosis" and "avascular bone necrosis." The relevant literature on both the conditions abbreviates both as "aseptic ischemic osteonecrosis in the jawbone" (AIOJ). To shed light on the clinical details of this condition, osteolytic jawbone samples of 24 patients with different systemic immunological diseases were examined using four steps: presurgical dental X-ray, postsurgical histology, polymerase chain reaction DNA analysis (PCR DNA) of bacteria, and RANTES/CCL5 (R/C) expression. 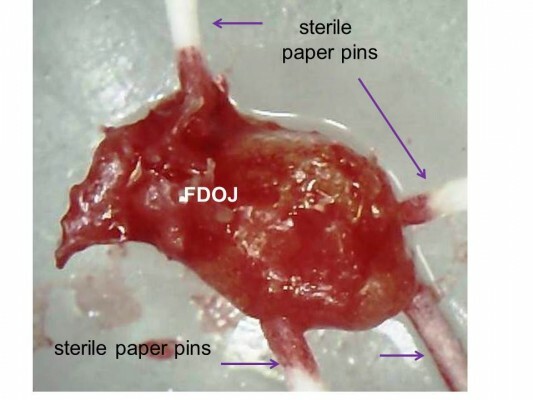 These four steps showed that neither X-ray nor histology delivered unambiguous results with respect to inflammatory processes; furthermore, the PCR results did not show evidence of any microbial load within the jaw samples. However, there is a striking, coherent overexpression of chemokine R/C in the AIOJ samples. This study proved the aseptic existence of "silent inflammation" within the jawbone. The ICD-10 (AIOJ) definition, which is hard to interpret, can now be substantiated with clinical evidence, while the cytokine expressions described in this report can explain the systemic immunological effects observed within the group of examined patients.